Fr Ismael Moreno, affectionately known as Melo, is a Jesuit priest, human rights campaigner and the Director of Radio Progreso. He is pictured leading prayers at an ecumenical vigil outside the US embassy in Tegucigalpa, Honduras. Radio Progreso is a Jesuit radio station based in El Progreso, Honduras. The station is internationally recognized for its role advancing human rights, promoting peace, supporting community-based communication initiative, and advocating for environmental protection across Honduras. Radio Progreso has been broadcasting since the 1980’s and has been involved in numerous community mobilization efforts in support of Indigenous people, Afro-descendants, peasants, women, and youth, both in Honduras and across Central America. Honduras has been mired in a series of human rights and democratic governance crises since 2009, when then-president Manuel Zelaya was ousted in widely denounced coup. High profile corruption cases, weakening institutions, and impunity followed. The country is presently one of the most dangerous places in the world for journalists, human rights defenders, LGBTQ activists, and environmentalists[i]. Latent discontent in the country erupted in late 2017 following a disputed and highly controversial presidential election that ultimately saw Juan Orlando Hernandez, the incumbent president, elected. The situation sparked mass demonstrations and violent state repression[ii][iii][iv]. Radio Progreso has been at the forefront of the post-election movement to call for transparency, accountability, and respect for human rights in Honduras. Fr Ismael Moreno, Director of Radio Progreso, spoke with Sean Hawkey during his most recent visit to the country. Sean Hawkey: How do you assess the current human rights situation in Honduras? Fr Moreno: ‘We need to have a firm understanding of what’s behind the current moment, [behind] this situation. There are systemic issues [to be addressed]. The institutions of this government do not guarantee human rights. The rule of law is subject to arbitrary decisions of a small group led by Juan Orlando Hernandez who have control over the three powers of the state (the executive, legislative, and judicial branches). [That means that the protection of] human rights depends on the will of the government team, and not on the institutional [and legal] order that should protect human rights. The precariousness of human rights here is that it is [ultimately up] to the people in charge of the Honduran regime. The defence of our human rights depends on how much the President’s team likes us, or rejects us. For example, if the Department of State of the United States, warns Juan Orlando Hernández that the human rights of particular people should be protected, their rights [will be] protected, temporarily. However, the human rights situation is still precarious [because there is no system in place to protect people’s rights]. It doesn’t depend on the rule of law. I was talking to a representative of the UN High Commission for Human Rights, and she told me that she spoke to the President, and [to] the Minister for Security, and asked for my human rights to be respected. That means that my human rights will be respected, but not because human rights per se are respected here, but because the current situation is one where there is arbitrary protection of people’s rights because of political pressure. The situation for us, human rights defenders, while Juan Orlando Hernandez is in power, is [one of] permanent and growing danger. Sean Hawkey: What is the role of the media in the current crisis? Fr Moreno: Media in Honduras is intimately linked to the groups who have power. In fact, power in Honduras is ultimately expressed through the capacity to control the media. The well-established national media in the country are associated with the five [most] powerful groups that exist in the country. Those are Grupo FICOHSA, Grupo Atlántida, Grupo Dinant, Grupo Terra and Grupo Karim. These groups bring together the 17 most powerful groups in Honduras, the 17 most powerful surnames in Honduras. The media – TV, radio and the printed press- normally follow the script [set by these powerful interests] that [says] that they shouldn’t [get anywhere near the interests] of those groups. [The media in Honduras] ultimately expresses the interests of these powerful groups. So, the media in Honduras is extremely conditioned by the owners, who are part of these economic groups, and who have more power than any government. They are the real government, and they have the ability to veto any sort of candidacy that could affect their interests. These are the five groups that were behind the coup of 2009, these are the five groups that are behind the re-election of Juan Orlando Hernandez, and these are the five groups that have the power of veto over any candidate that [even remotely resembles] Manuel Zelaya. Manuel Zelaya represents a threat to these five powerful groups. These five groups are tightly linked to the embassy of the United States of America. For the government of the United States, Honduras is of geopolitical [importance], though they have no interest for what life is like in the country. They are wary of political instability. They prefer alliances with [established] politicians, even if they are tainted by corruption and are responsible for human rights abuses. The media here, in many different ways, try to hide the reality that people live, try to hide the extreme differences between wealth and poverty in Honduras, and that the wealth is in so few hands. And they try to hide the repudiation of this [inequality] by the majority. And they try to maintain a situation that favours investments by the five groups and the United States. The media here, in essence, abuse freedom of expression. They work against the role of the media, which is to inform, generate informed opinion and generate a culture of participation and coexistence and peace. Sean Hawkey: How does the media and the powerful groups behind it exercise this power? The big media are the property of these sectors of power. So, for media that aren’t following the script- the ones that have relationships with human rights defenders and with the opposition, and that are [beyond] the control of the government and these five powerful groups- there is a five step process that is sharply adhered to. The first step is to ignore them. For us [at Radio Progreso], who have a different point of view than the government’s, or who question the government, we’ll never be invited to a TV station to give express our view. They’ll never run a story on who we are and what we do. We are ignored. When, for different reasons, we can’t be ignored, they will twist information about us, on what we do, they will stigmatise us, they will discredit us. For example, they won’t talk about what we do or say, but they will call us rebels, revolutionaries. They’ll say that we stand in the way of development, or they’ll say that we are linked to organised crime, or that we have old ideas that [are incompatible] with modernity. They stigmatise us, they discredit us. If that doesn’t work, they’ll try to co-opt us, to bribe us in many different ways. It can be with money, but not necessarily with money. It might be through recognitions, invitations to participate in bodies or events that deal with human rights, to go to five-star hotels. All of this is to make journalists [linked] with the opposition feel like they belong there. When that doesn’t work then they try to criminalise us, which is the fourth step. When discrediting us doesn’t work, trying to buy us off doesn’t work, and we can’t be ignored, then they criminalise independent media. That’s why the Penal Code has been reformed, to enable accusations of terrorism and treason. If none of that works, then they go to the fifth step which is assassination. Sean Hawkey: How has this affected Radio Progreso? We’ve been ignored, but they can’t ignore us completely. They’ve tried to co-opt us and buy us off. Last year they tried to give me the government prize for human rights, I would have been part of their game if I’d accepted it. That hasn’t worked. They’ve tried to stigmatise us, they’ve produced posters [with supposed links to organised crime for example]. Attempts have been made to criminalise us. They have sabotaged our transmission tower in Tegucigalpa. And now we are trying to avoid that last step. WASHINGTON, D.C.– The violent aftermath of the Honduran presidential election — triggered by allegations of electoral fraud — has led to serious human rights abuses, Honduran advocates said Thursday, strongly advising the Trump administration not to deport immigrants back to a country repressed by deadly government security forces. At an event sponsored by Alianza Americas, a transnational network of immigrant organizations, two Honduran-based speakers shared their on-the-ground perspective of the dangers they have faced after President Juan Orlando Hernández’s reelection. Joaquin Mejia — a lawyer and human rights advocate who works as a commentator at the Jesuit radio station Radio Progreso — expressed concern over the legitimacy of his country’s presidential elections and indicated that his life was at risk for openly criticizing Hernández and the military police. The Honduran constitution has since the 1980s explicitly enforced a one-term presidential limit. Hernández sought to change the constitution to ban term limits. Claudia Mendoza — a freelance journalist who has worked with Univision — also pointed out at the event the “shameful” silence by the Honduran news outlets to suppress news about the brutality at the hands of the country’s military police. Mejia and Mendoza both noted that violent clashes between opposition supporters and the military police have led to the deaths of dozens of activists, hundreds of injuries, and thousands of detentions. Into January 2018, the Honduran government reportedly used security forces to tamp down protests using tear gas, batons, and live ammunition, according to a Latin American Working Group Education Fund report, brutally stiffing press freedom and imposing curfews in post-electoral Honduras. In the face of mounting violence following Hernández’s reelection, the U.S. embassy accepted the country’s election results, despite misgivings by the Organization of American States (OAS) which called for a presidential election do-over. Mejia has been advocating for a fair electoral process and said he was “hopeful” that the Honduran youth would turn out for future elections. He also wants the U.S. government to stop deporting people back to a country beset by violence and forced displacement. As of February 9, the U.S. government has deported 2,279 people to Honduras, according to Consular y Migratorio de Honduras (CONMIGHO) data. CONMIGHO receives USAID funding and is affiliated with the Honduran Secretaría de Relaciones Exteriores y Cooperación Internacional. Tens of thousands of Honduran Temporary Protected Status (TPS) recipients may also be at risk of deportation if the U.S. Department of Homeland Security (DHS) fails to renew their statuses by July 5, 2018. Many people are driven to flee their homes for another city in Honduras because of ongoing threats and assassinations, as the Latin American Working Group Education Fund graphic below shows. Mejia himself has faced a constant barrage of threats because of his stance against the Hernández government. When asked his position on the Trump administration’s efforts to make it very difficult for people to seek humanitarian relief — like asylum or refugee status — on claims of fraudulent interviewees being “coached” to make up lies about Honduras, Mejia shook his head. “The Trump administration has this theory about immigrants, but at the same time it’s supporting a regime that’s provoking a political situation that is going to provoke an increase in the immigration to the U.S., Spain, Costa Rica, and an increase in asylum and refugee seekers,” Mejia said. The United States has long had an over-sized influence in the country, investing hundreds of millions of dollars in security assistance to help fund elite military and police units, The Guardian reported. As the publication explained, these units have helped push down Honduras’ murder rate, but the country is still one of the most violent places in the world. Mejia fears that mass deportation from the United States would trigger more instability at a time when Honduras has yet to resolve widespread doubts over electoral irregularities. 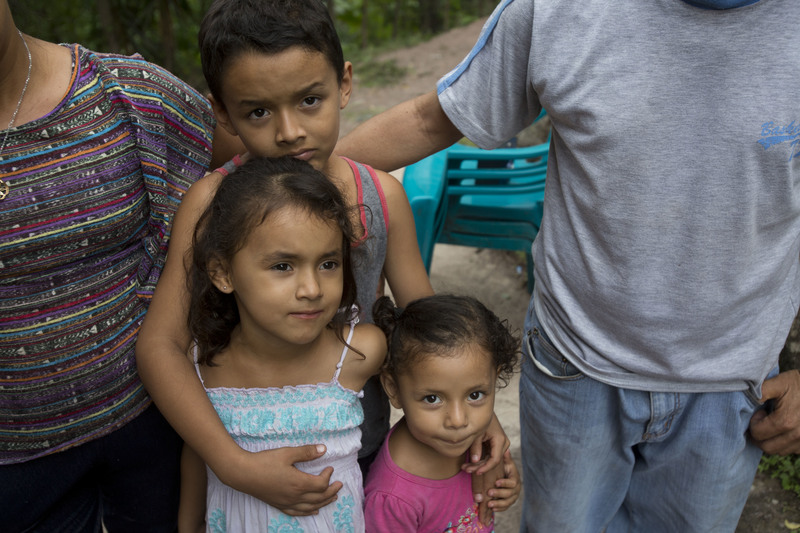 Beyond the scale of U.S. immigration policies, Mejia and Mendoza have noticed a troubling trend in Honduras that affects every resident. As a journalist Mendoza has observed other press coverage being too favorable towards the Hernández government or has presented no criticism of the brutal oppression. News coverage of the large-scale protests “emphasize property damage and not human life,” she said. Mendoza pointed to the death of Kimberly Dayana Fonseca, a 19-year-old who went to look for her brother during anti-government protests and was killed with a bullet to the head on the first night a curfew was put in place in the country. Military police shot live rounds into the crowd, but the prosecutor’s office “tried to blame” her death on a tear gas canister, the Miami Herald reported in January. Radio Progreso, an important independent voice in a country where most broadcast outlets are controlled by special interests, serves both rural communities and large cities. In the last several years, two employees of ERIC-Radio Progreso have been murdered and threats have been made against others. In late March of this year, a defamation campaign targeted Fr. Melo and other activists. El 11 de abril Carlos Mejía Orellana, gerente de mercadeo y ventas de la Radio Progreso de Honduras, fue asesinado. El crimen permanece impune. ¿Cuál fue el móvil? ¿Quiénes fueron los asesinos materiales? ¿Y los intelectuales? Parece un crimen perfecto. Porque el probable móvil político está envuelto en la coartada de la condición homosexual de Carlos. Con este texto, la revista Envío, hermana del proyecto de Radio Progreso, se suma a la condena por este crimen. “Pero para la radio, ¡siempre estoy! ¡Nos vemos!”. Horas después, llamaban a la radio, pero para avisar que Carlos Mejía estaba muerto. Era el 11 de abril, ese día que el calendario católico ha bautizado como “viernes de dolores”, al inicio de la semana santa. Carlos Mejía Orellana tenía 35 años. Desde hacía 14 años era el gerente de mercadeo y ventas de Radio Progreso, la popular emisora de los jesuitas en la ciudad de El Progreso. “Era una persona clave en este proyecto”, repiten todos en el equipo. Ya era tarde cuando llegó a su casa. Vivía solo, en una colonia de la ciudad. Al poco de llegar una vecina tocó a su puerta para pedirle el maíz que iba a moler para las tortillas que iba a llevar al paseo al mar que había organizado para el domingo con toda su familia y sus amigos. “Me dijo que me daría el maíz después porque estaba esperando visita y quería platicar tranquilo”, contó ella. Un par de horas después empezó a sonar estridente la alarma de su carro, parqueado a la puerta de su casa. Los vecinos salieron a ver qué pasaba. El portón de la casa de Carlos estaba abierto, la puerta de la casa también, pero no estaban forzados. ¿Un robo…? Entraron a la casa, con esa mezcla de ansiedad y miedo que se tejen en la atmósfera que respira hoy tanta gente en Honduras, el país más violento del continente y quizás del mundo. Al entrar al cuarto de Carlos lo vieron tendido en el piso, al lado de su cama, con el pecho atravesado por tres puñaladas. Salieron corriendo a avisar a la policía y al equipo de la radio. Quienes lo mataron movieron de lugar el televisor y varias cosas de la casa, dejando señales de que se trataba de un robo como otros tantos. Pero en la casa nada faltaba, nada había sido robado. En la edición del día siguiente, el diario hondureño “La Prensa” informaba de las declaraciones de Roger Murillo, jefe de la Dirección Nacional de Investigación Criminal (DNIC): “Las primeras pesquisas indican que, minutos antes de ser asesinado, salió a comprar dos pollos para él y otras personas que en ese momento lo acompañaban en la casa y al parecer estaban departiendo”. Anunciaba Murillo que como resultado de la labor investigativa, los agentes habían detenido horas después del crimen a un joven que había dicho ser “pareja” de Carlos. Y sacó la conclusión: “Creemos que el crimen puede estar relacionado con problemas pasionales y no por cuestiones políticas, como lo quieren dar a entender los encargados de Radio Progreso”. Y es que horas antes de estas declaraciones, el equipo de Radio Progreso había convocado una rueda de prensa para informar del suceso y sentar su posición. El director de la emisora, el sacerdote jesuita Ismael Moreno, corresponsal de Envío en Honduras, fue categórico al exigir una “investigación seria, diligente, precisa y exhaustiva, que lleve a sancionar a los responsables materiales y a los responsables intelectuales”. Y añadió: “No aceptamos rumores sin sustento sobre los móviles”. Para entonces, los rumores ya corrían por la calle y parecían facilitarle a las autoridades dar por cerrado el caso con el veredicto de que se trataba de un crimen “pasional”. “Todos los maricones acaban así”, decía mucha gente, al sólo conocer la noticia, sin más reflexión y sin compasión. La coartada estaba servida. El cuerpo de Carlos fue encontrado semidesnudo. El escenario repetía el modus operandi de muchos asesinatos relacionados con personas homosexuales a las que se les quita la vida. Naturalizando el móvil, se les quita también dignidad, restándole importancia y atención al crimen. Carlos era gay. “Lo había hablado con él hacía años y él no temió reconocerlo, reconocerse a sí mismo con esa orientación y no ocultarlo ni a su familia ni a sus compañeros, era una persona libre”, nos cuenta Ismael Moreno, el padre Melo. En algunas horas, el joven detenido fue dejado libre. No había una sola prueba que lo incriminara. El caso no estaba cerrado, pero insistían en cerrarlo por la vía “pasional”. ¿No podría ser otro el móvil, aun contando con el escenario “pasional”, tan bien preparado por los ejecutores materiales? “Lo entendemos como un golpe frontal al trabajo de la radio, a nuestro trabajo y a nuestra institución”, dijeron el padre Melo y sus compañeros de la radio desde el primer momento. “Esto nos deja más vulnerables y en mayor indefensión”. Ante los micrófonos de la emisora otras voces comenzaron a abrirle camino a otro probable móvil. Una de esas voces fue la de Silvia Heredia, del programa “Paso a paso” para la prevención de la violencia: “No, ésta no es una muerte más, es una muerte buscada. Todos los asesinatos son injustos, pero éste ha sido para tocar al ERIC y a Radio Progreso”. Para evangelizar el Valle de Sula, el área de mayor desarrollo económico de Honduras, la que más población migrante atrae de otras regiones del país, nació hace más de 50 años Radio Progreso. La radio comenzó a emitir en Santa Rita, un pequeño municipio cercano a El Progreso, sin ser propiedad de los jesuitas. En 1970, en los años marcados por la opción por los pobres proclamada por los obispos en Medellín, en la etapa en que Paulo Freire proponía la concientización por la educación popular, en el tiempo de las comunidades de base, los jesuitas adquirieron la frecuencia AM de aquella radio y enseguida consiguieron equipo para transmitir también en onda corta. Cuando el huracán Fifí causó tragedias en la zona en 1974, Radio Progreso dio a conocer al mundo la noticia. Otras tragedias, las provocadas por los golpes de Estado que caracterizaron aquella década, también pasaron por los micrófonos de la Progreso. Fueron también las ondas de Radio Progreso las que informaron de la masacre de Los Horcones(junio de 1975), en la que terratenientes y militares tramaron y ejecutaron la muerte de quince personas, entre ellas dos sacerdotes, y para borrar las huellas del crimen los lanzaron a un pozo de malacate, donde dinamitaron sus cuerpos. En 1976 la emisora se transformó definitivamente en una radio popular al servicio de las luchas del pueblo y de las causas justas, que en Honduras eran tantas. No hubo huelga, demanda, reclamo, manifestación, movilización y organización que los micrófonos de la Progreso no acompañaran. Eso la convirtió, una y otra vez, en objetivo de los poderosos políticos y de los poderosos económicos. Advertencias, amenazas, cierres, negociaciones para reabrirla, años y años siempre en la mira. Hasta hoy. En 1980, tras uno de los cierres de la emisora y estando Honduras bajo una dictadura militar represiva, los jesuitas crearon el ERIC (Equipo de Reflexión, Investigación y Comunicación), para complementar la labor de la radio. Sería un espacio para reflexionar sobre la realidad, para “ver, juzgar y actuar”. Con los años, las investigaciones políticas, sociales, económicas y culturales del ERIC, y desde el año 2010 los sondeos de opinión pública, se fueron convirtiendo en referentes de credibilidad en todo el país. Hasta hoy. En junio de 2009, cuando el golpe de Estado contra Manuel Zelaya, la Radio Progreso y el ERIC se graduaron nuevamente con honores en la defensa de los derechos humanos y en las denuncias de la represión desatada contra la gente que se movilizó en resistencia al golpe y reclamando derechos postergados. A partir de esa fecha y de esa crisis nacional la emisora comenzó a ser un referente para autoridades y organismos internacionales de derechos humanos. Prueba de ello son los dos premios internacionales que recibió la radio, el Premio de la Asociación por los Derechos Humanos de España (APDHE),entregado a Radio Globo, a Cholusat Sur y a Radio Progreso por su defensa de los derechos humanos en el marco del golpe de Estado, y el Premio Peter Mackler 2011 de Reporteros Sin Fronteras y Global Media Forum, entregado a la coordinadora del área de comunicaciones de Radio Progreso por el ejercicio del periodismo en países en los que hay violaciones permanentes a la libertad de expresión. Con el golpe aumentaron los riesgos. Las instalaciones de la radio fueron allanadas durante el golpe y algunos de sus periodistas y su director fueron objeto de graves amenazas y actos de hostigamiento. La Comisión Interamericana de Derechos Humanos (CIDH) de la OEA otorgó a unas quince personas del equipo medidas cautelares para proteger sus vidas. En mayo de 2011 se las otorgó a Carlos Mejía, quien también recibía amenazas. El Estado hondureño, responsable de cumplir esas medidas, nunca las tomó en serio. “Nunca tuvo voluntad política de cumplirlas, a pesar de haber sido consensuadas con el gobierno en infinidad de ocasiones”, explicaron miembros del equipo de la radio en la rueda de prensa, fresca aún la sangre de Carlos. Honduras es considerado el país más violento del mundo. De acuerdo con el Observatorio de la Violencia de la Universidad Nacional Autónoma de Honduras, en 2013 se cometieron 109 masacres y 6,757 homicidios, lo que representó un promedio mensual de 563 homicidios y un promedio diario de 19. Un informe dado a conocer por Casa Alianza reveló que entre febrero de 1998 y marzo de 2014 fueron asesinados 9 mil 291 niños, niñas y jóvenes menores de 23 años. Durante el gobierno saliente, el de Porfirio Lobo (2010-2013), el promedio fue de 81 muertes de jóvenes mensuales. En el primer trimestre del año 2014 Casa Alianza contabilizaba ya 270 muertes de jóvenes menores de 23 años en hechos de “extrema violencia”. Ni la depuración de los cuerpos de seguridad de hace años, ni la más reciente militarización de la sociedad con las sucesivas campañas de “mano dura”, han dado resultados, entre otras razones porque dar respuestas auténticas a las profundas desigualdades económicas, sociales y políticas quedan siempre al margen de estas iniciativas. Una de ellas, desde junio de 2011, es la Ley de Seguridad Poblacional, que establece el cobro de impuestos a depósitos de cierta cantidad en el sistema bancario, a los restaurantes de comidas rápidas, a la telefonía celular, a los casinos y tragamonedas. Los recursos recaudados se deben invertir en seguridad pública. Se calcula que desde la creación de este impuesto se han recaudado más de 1,500 millones de lempiras, pero unos mil millones ya han sido invertidos de forma discrecional, sin saberse en qué. Lo que sí se sabe es que la policía de investigación trabaja en condiciones precarias, sin vehículos y agentes suficientes y sin herramientas básicas para desarrollar investigaciones serias, diligentes, precisas y exhaustivas, como las que reclamó el equipo de Radio Progreso tras el asesinato de Carlos Mejía. Quisimos hablar con quien recuerda y llora a Carlos como su mejor amigo para que nos contara cómo era: “Amaba a los perros. Y amaba a la gente. Era un tipo muy generoso. Le admiré que iba mediodía de cada domingo a dar clases al Instituto Hondureño de Educación Radiofónica. Quería que ese montón de chavos trabajadores y con deseos de superación tuviera al menos algo de buena educación. Y por eso, no descansaba el único día que le quedaba libre. Le gustaba dar clases. Tenía una licenciatura en Pedagogía. Era incisivo, profundo cuando analizaba la realidad hondureña. Le dolía la corrupción, la injusticia, el descaro de los políticos y de los líderes religiosos y le desesperaba la pasividad del pueblo”. Así lo describe: “Era audaz, lanzado, siempre queriendo innovar, probar cosas nuevas, un emprendedor nato. Tenía una Maestría en Dirección Comercial y Mercadotecnia, pero sus capacidades se formaron porque desde niño tuvo que ingeniárselas para ayudar a su familia. Un día me contó su primera prueba. Cuando tenía seis años su mamá, doña Salvadora, lo mandó a la plaza del pueblo a vender los tamales que ella hacía. Se sintió tremendamente responsable con su carga de tamales. Pasó que cuando los había vendido casi todos, cuando se le acercó un viejito diciéndole: “Dejame probar uno y te traigo el pago en un ratito”. Carlos le creyó, le dio el tamal y se quedó mucho rato esperando el pisto que nunca llegó… Regresó a su casa llorando, temía la penqueada que le darían por no traer el dinero completo. Qué va, su mama lo felicitó por el éxito de la venta y también porque aquel pobre viejito pudo probar uno de sus tamales. Y él dejó de llorar”. El asesinato de Carlos Mejía priva a Radio Progreso de la persona que con extraordinaria habilidad y dedicación, garantizaba a la emisora el 60% de sus ingresos. Y lo arranca de esta tarea en momentos en que la radio, una herramienta de movilización social, conocida y reconocida en todo el país, vivía momentos de expansión, proceso en el que participaba activamente Carlos. A partir de 2005, Radio Progreso amplió su cobertura al occidente y al norte del país. A partir de 2009, en la etapa abierta por el golpe de Estado, la propuesta de comunicación de la emisora se amplió significativamente, fortaleciendo alianzas con sectores sociales: mujeres, indígenas, pobladores, ambientalistas, organizaciones de derechos humanos y organismos anticorrupción. Las alianzas se concretaron en un incremento de los espacios radiales conducidos por esas organizaciones, en campañas de sensibilización llevadas a cabo en coordinación con varias de ellas y en una mayor demanda de formación y apoyo que le solicitaban movimientos organizados de todo el país. Radio Progreso crecía “en sabiduría y gracia”. Su influencia era cada vez más patente. En 2012 amplió su cobertura en el departamento de Colón y en la ciudad de La Ceiba, tercera ciudad del país, después de Tegucigalpa y San Pedro Sula, cubriendo así prácticamente todo el corredor norte de Honduras. A finales de 2013 el gobierno saliente de Porfirio Lobo le concedió una frecuencia en la capital. Esto estaba representando nuevos desafíos, que estaba asumiendo ya el equipo: ampliar el contenido de los espacios noticiosos y las estrategias de participación, tomando aún más en serio el modelo de la radio en la calle y el periodismo de intermediación. Cuando Carlos Mejía fue asesinado la emisora iba a ampliar su cobertura en el Bajo Aguán, zona del país donde se identifica de manera más clara la acumulación de capital en pocas familias, una zona extremadamente violenta, en la que, en términos del grado de violencia contra la población campesina, se desarrolla el conflicto agrario más grave de los últimos quince años, no sólo en Honduras sino en toda Centroamérica. Durante el gobierno de Porfirio Lobo fueron asesinados 105 líderes campesinos, muchos de ellos en esta zona. En este contexto, no es prejuicioso ni apresurado pensar que el asesinato de Carlos Mejía haya tenido como móvil enviar al equipo un mensaje de sangre con la intención de frenar la expansión y la influencia de la radio. Bien elegido el momento del mensaje. Bien elegida la víctima, porque de ella dependían muchos recursos financieros. Bien elegido Carlos, porque su homosexualidad facilitaba a quienes decidieron eliminarlo el escenario para la más sencilla de las coartadas: la “pasional”. Un crimen perfecto. En un muro de Tegucigalpa alguien escribió un día un grafiti provocador: “Ser homosexual es cosa de hombres”. Muy pronto lo borraron, aunque le sobraba razón al que lo pensó y lo expuso. Porque soportar la discriminación de la homofobia es una tarea que requiere de mucho valor, el valor que la cultura asigna a los hombres. Carlos tuvo ese valor. La homofobia sigue siendo uno de los prejuicios más incrustados en la mentalidad de la gente. Y como sucede en todas las sociedades tradicionales, conservadoras, empobrecidas por las desigualdades y por la baja calidad de la educación, Honduras tiene una sociedad homofóbica, en la que son muchos los que han confundido los conceptos: llaman “pecado” a la homosexualidad, cuando el pecado es la homofobia, por lo que encierra de discriminación, de rechazo y de odio, de traición al Dios del que habló Jesús de Nazaret. El alto nivel de homofobia que existe en la sociedad hondureña adquirió relieve internacional en octubre de 2011, con las posiciones expresadas por la Confraternidad Evangélica de Honduras, que pidió a las autoridades suspender un concierto que Ricky Martin iba a tener en Tegucigalpa a beneficio de una fundación de ayuda a la infancia. Martin había confesado su orientación homosexual un año antes. En carta al Ministro del Interior, los religiosos expresaban su preocupación por “el mensaje y ejemplo” que transmitiría el cantante, en momentos en que se requiere “levantar y cultivar los más altos valores cívicos y morales tendientes a consolidar y a no debilitar la esencia de la nacionalidad hondureña, que es la familia”. A pesar de todo, el concierto se celebró. Unos meses después del “escándalo” por este concierto, en junio de 2012, ochenta congresistas estadounidenses escribían a la entonces Secretaria de Estado Hillary Clinton pidiéndole que exigiera al gobierno de Honduras -a cuenta de la ayuda que recibía de Estados Unidos- medidas contra la homofobia que sufren las personas homosexuales en Honduras. En su carta, los congresistas demócratas denunciaban “crímenes de odio”: unos 70 hombres y mujeres pertenecientes a la comunidad LGBT (Lesbianas, Gays, Bisexuales y Transexuales) habían sido asesinados en Honduras desde junio de 2009, fecha del golpe de Estado, hasta la fecha en que escribían a Clinton. Señalaban también que la mayoría de estos asesinatos habían quedado “en la más absoluta impunidad”. Este país violento y homofóbico que es hoy Honduras, es también un país donde reina la impunidad. Según el Fiscal General de la República, el 80% de los asesinatos no se investigan y quedan en la impunidad. Las organizaciones de la sociedad civil consideran que la cifra es mayor y hablan del 90%. De más de 30 asesinatos de periodistas, solo el 10% presentan alguna investigación. Un ejemplo trágico es el de los asesinatos de mujeres: de los 300 femicidios ocurridos en 2013, sólo se han presentado en 5 casos se han presentado los requerimientos fiscales para resolverlos, según información del Centro de Derechos de Mujeres. Los asesinatos que cometen el crimen organizado y el narcotráfico quedan en la impunidad. También los asesinatos políticos quedan en la impunidad. ¿Quedará impune el asesinato de Carlos Mejía, recubierto su posible móvil, su dimensión política, tanto por las autoridades como por sectores de la sociedad con la coartada de “lo pasional”? A Radio Progreso llegaron en los días siguientes al crimen muchos mensajes y comunicados de solidaridad con la emisora y de repudio por el crimen. el crimen no quedara en la impunidad. El equipo de Radio Progreso sigue esperando la verdad y la justicia. Y mientras espera, recuerda al “compañero del alma tan temprano” que se les fue. a las reuniones y siempre las consideró una pérdida de tiempo. Tampoco aprendimos de usted a hacer un análisis político ni técnicas para diseñar un plan estratégico. Pero usted bien sabe que ninguna cosa de ésas pudieron hacerse ni en la Radio ni en el ERIC sin su silenciosa pero efectiva actividad de mercadeo. Usted nos enseñó con su práctica cotidiana aquello que escuchamos de los analistas: que incluso la más sublime de todas las actividades requiere de lo económico como base para subsistir”. y otros presentábamos noticias y otros nos quemábamos la materia gris sacando adelante un texto, usted compraba una provisión cada quincena para una anciana mujer abandonada. Y eso nunca quiso que saliera a luz, porque nunca quiso sacar pecho con sus obras de solidaridad. Fue el testimonio de esa anciana quien sacó a luz una de sus múltiples virtudes cuando ya las puñaladas de sus asesinos lo habían arrancado de nuestra vida”. “Lo último que usted nos dijo antes de abrir la puerta para irse en aquel viernes once de abril, nos da la pista para seguirlo teniendo entre nosotros. Al decirnos adiós nos dijo que se iba de vacaciones y que sólo respondería si la llamada era por alguna publicidad para la Radio. Entonces, digamos que usted se fue de vacaciones y mientras descansa, ojalá recostado en una hamaca, le haremos llamadas para consultarle sobre lo que hacemos y usted no vacilará en responder a nuestras llamadas, porque así nos lo dijo al despedirse. Desde ya, querido Carlos, espere la llamada que le haremos para pedirle el consejo de cómo montar una pauta radial para informarle a todo nuestro pueblo que de las puñaladas con que lo mataron están brotando flores que llenan de energía nuestra incansable lucha contra la impunidad”. Dear Minister Baird, We the undersigned are outraged and deeply saddened by the news of the murder of Carlos Mejía Orellana on April 11, 2014, a journalist and marketing director of Radio Progreso, a Jesuit community-based radio station in El Progreso, Honduras. We would like to express our deepest condolences to Carlos’ family members, friends and colleagues. Our thoughts and prayers are with all who are mourning this senseless death. Following the coup d’état in 2009, Carlos and other Radio Progreso employees have been targets of repeated death threats because of their commitment to journalistic and social expression, and documentation of abuses of power and impunity. The Inter-American Commission on Human Rights (IACHR) has repeatedly granted precautionary measures to 16 staff members of Radio Progreso, including Mejía Orellana, due to persistent threats against them. The Director of Radio Progreso, Father Ismael “Melo” Moreno, SJ testified before the U.S. Congress at the Tom Lantos Human Rights Commission and described the constant death threats and attacks perpetrated with impunity against journalists in Honduras, including against Radio Progreso, its employees and its research arm, ERIC. Since last spring, Canadian parliamentarians have heard disturbing testimony about the deteriorating human rights situation in Honduras in the Parliamentary Subcommittee on International Human Rights. Given the level of threats and violence, including assassination, targeted against journalists, the media and freedom of expression in Honduras, we are dismayed and disturbed that the Government of Honduras has failed to implement protective measures for the employees of Radio Progreso, as called for by the IACHR. Honduras is one of the Western Hemisphere’s most dangerous places for the media. Death threats are often carried out and impunity prevails. Honduras continues to have the highest murder rate in the world (90.4/100,000) according the United Nations Office on Drugs and Crime (UNODC). We ask the Canadian government to call on the Honduran authorities to immediately implement protective measures ordered by the IACHR and to carry out a thorough investigation into the murder of Carlos Mejía Orellana, to find those responsible for this heinous act and bring them to justice in a timely manner. Further, in consideration of continuing human rights abuses in Honduras, we ask that the Canadian Parliament, oppose and/or withdraw all support to Bill C-20, the Canada-Honduras Economic Growth and Prosperity Act, and do all that is necessary to ensure that it does not become the law of the land. Trade on April 8, 2014 emphasizes that the trade deal risks exacerbating human rights violations such as this, in Honduras. Honduras: persiste la impunidad en ataques a periodistas y defensores de DD.HH. Tegucigalpa, Honduras (Conexihon).- Dos expertos en derechos humanos de Naciones Unidas pidieron hoy al Gobierno de Honduras que ponga fin a la impunidad en los casos de violencia contra periodistas y defensores de derechos humanos a través de investigaciones rápidas y exhaustivas. “La impunidad sigue reinando en Honduras en los casos de amenazas, hostigamiento y violencia contra periodistas y defensores de derechos humanos”, advirtió el Relator Especial de la ONU sobre la libertad de opinión y de expresión, Frank La Rue, y la que se ocupa de la situación de los defensores de derechos humanos, Margaret Sekaggya. Los expertos señalaron que la impunidad perpetúa estos crímenes y que en la gran mayoría de los casos, los responsables de estos actos no llegan a ser identificados. Los Relatores Especiales destacaron que la lucha contra la impunidad a través de procesos judiciales también contribuye a la reparación adecuada de las víctimas y sus familiares. “Ni las medidas cautelares ordenadas por la Comisión Interamericana de Derechos Humanos, ni las reiteradas recomendaciones formuladas por los expertos de la ONU, han sido suficientes hasta ahora para que Honduras adopte medidas firmes para la protección de los periodistas y los defensores de derechos humanos”, según los expertos. Los relatores sumaron sus voces a las condenas por el asesinato de Carlos Mejía Orellana, miembro del equipo de Radio Progreso en Honduras, y expresaron su solidaridad con sus familiares y colaboradores. A worker at a Jesuit-run radio and social action centre in Honduras has been stabbed and killed in what is believed to have been a politically-motivated attack. 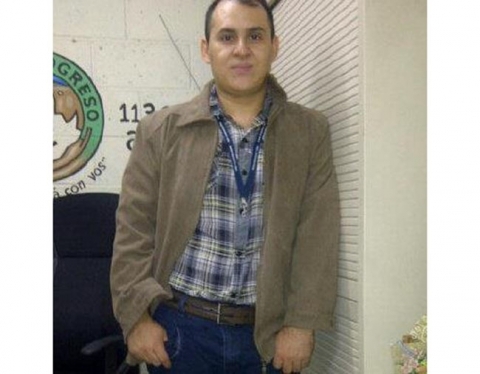 CAFOD partner Carlos Mejia Orellana (pictured), a 35-year-old lawyer who worked for ERIC-RP was stabbed four times in the chest at his home in El Progreso. The Catholic aid agency vowed yesterday that the struggle for justice that he helped to lead will go on. Carlos and other colleagues at ERIC-RP had received repeated death threats in response to the organisation’s advocacy and communications work, through which they challenge injustice and corruption in the government, police and judicial system. The threats against Carlos were so serious that, for the last five years, the Inter-American Court of Human Rights has called on the Honduran government to provide him with special protection measures. Sadly, no such protection was provided. CAFOD currently supports the work of ERIC-RP in the Atlantic coastal region of Honduras where programmes cover human rights, water, livelihoods and disaster risk reduction. The social action centre is one of the organisations that protested against the recent appointment of Roberto Herrera Caceres as the new Human Rights Ombudsman, asserting his links to the 2009 presidential coup and mining interest groups and his insufficient experience in human rights law. At a press conference, ERIC-RP’s director, Fr Ismael Moreno SJ, rejected rumours implying that Carlos’ death was linked to relationship difficulties and insisted that the police carry out a thorough investigation. According to UN statistics, Honduras has the world’s highest murder rate. Last year, an average of 20 people were murdered every day in Honduras, a country of just eight million inhabitants. El Progreso is close to San Pedro Sula, where the homicide rate is 173 per 100,000 people, reportedly the highest in the world outside a war zone.